During the early 1970’s while managing my father’s pool plastering company, I would occasionally see little calcium nodules (crusty or crystalline bumps) that had formed in our previously remodeled (re-plastered) pools. I would get a sick feeling in my stomach because I knew that we would be re-plastering that pool again, for free. The “white” calcium nodules weren’t so bad to look at, especially with white plaster, but I knew there was a more critical problem underneath. The plaster was losing its’ bond to the old plaster underneath, causing delamination and cracking. I knew that my plastering crew had not done a good prep job to bond the new plaster to the old plaster. Other plastering companies that I knew had the same position. 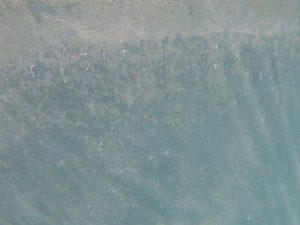 The exception to that was when the Los Angeles area had a severe earthquake in 1971 and many pools were damaged with cracking and delamination. It was felt that those situations were not covered under warranty. Nodules form randomly and sporadically, and are raised and rough. Sometimes only two or three nodules will form in an entire pool, and sometimes there can be more than one hundred. Starting in 1992, Greg Garrett and Jonathan Dongell (NPC members) began to publicly claim that “aggressive water” led to the formation of calcium nodules, but without proof of their theory. An article regarding their views and onBalance’s followed. (P&SN, 4/19/95 Nasty Little Nodules). At that time, Garrett and Dongell suggested that aggressive pool water can “drill” a pinhole through the entire thickness of a plaster coat (via pure calcium hydroxide “veins”), and subsequently cause a nodule to form. That theory is baseless. 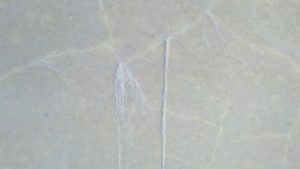 There are no “veins” of calcium hydroxide in well mixed and applied pool plaster or other cement/concrete products. In 1997, onBalance submitted research information to Pool & Spa News for an article (Negating Nodules, 2/12/97) which explained how and why nodules form randomly, and why LSI aggressive pool water does not cause pool plaster to crack, delaminate, or create pinholes and voids, and then result with calcium nodules. After that article in 1997, nothing was heard in opposition. This year (2017) however, I came across a new video by Greg Garrett, who is now the NPC Technical Director and who is also performing pool inspections, suggesting again that aggressive water leads to calcium nodules forming. (Greg also claims that aggressive water causes white plaster to turn blotchy gray, and causes “spot etching” (white spots that are smooth to the touch. However, cement petrographers have determined that improper materials and workmanship leads to spotting and graying of both pool plaster and concrete). Of course, what is true is that LSI aggressive water will cause uniform etching and roughness throughout a pool and not just in random areas, of quality applied plaster/cement surfaces. The only way that aggressive water can cause a “local” effect on plaster is if the plaster has a “local” defect. In explaining his “aggressive water” theory for calcium nodule formation in his video, Greg criticizes that I (Kim Skinner) and Que Hales are avoiding the fact that aggressive water dissolves calcium hydroxide, which is a minor cement/plaster component. No, we aren’t. But more importantly, calcium hydroxide is somewhat soluble, and balanced water, and even positive LSI water, can and does dissolve calcium hydroxide, which Mr. Garrett avoids. Nodules are comprised of calcium carbonate and are formed by positive LSI water. And since aggressive water dissolves calcium carbonate, it is absurd to think that LSI aggressive water will form nodules. But the main point is that aggressive water does not cause “quality applied pool plaster” to delaminate, crack, create voids or pinholes, which is the underlying problem for why nodules form. Sometimes, delaminated areas are very small (one square inch), and some are so large (10+ square feet) that they just “pop off” the pool walls and floors. Furthermore, let’s note that the Cal Poly/NPIRC/NPC studies showed that test pools with aggressive water did not result in cracking or pinholes, and calcium nodules forming. Most plastering companies know how to achieve a good bond by doing good prep work when re-plastering pools. But some companies may not, and may falsely blame aggressive water, or even high pH water when nodules form. They should be held accountable and not enabled by NPC representatives. We hope the NPC will acknowledge that calcium nodules are the result of an improper plaster application or bonding issue and are not due to improper water balance.